Mark Valenzuela, left, with Tech Effect coworker Michelle Del Rio. Computer trouble? Wi-Fi not working? Need to borrow equipment? 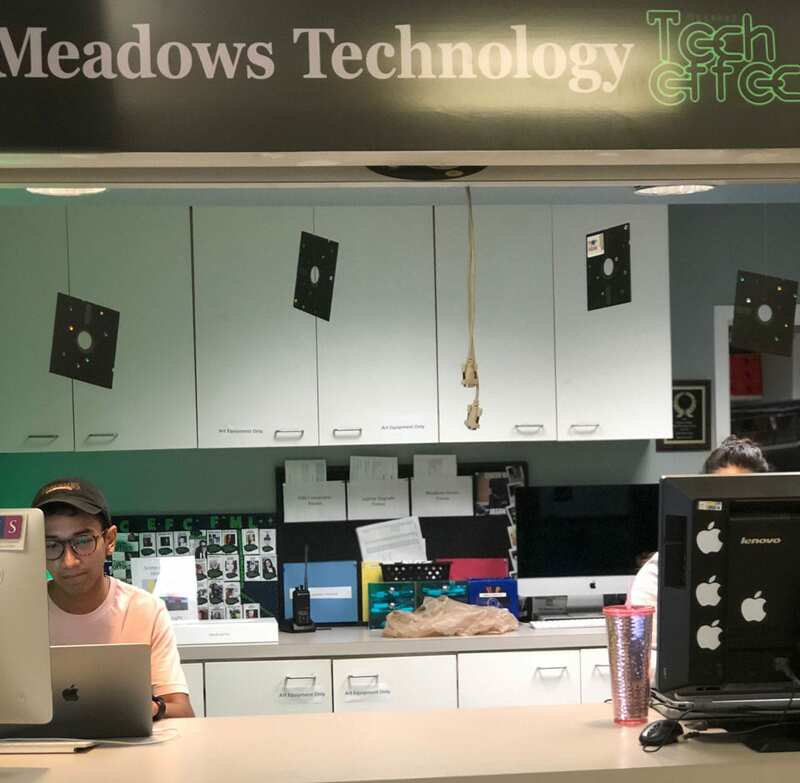 Meadows Tech Effect provides year-round effective solutions to these problems, helping students, faculty and staff operate at the highest level. 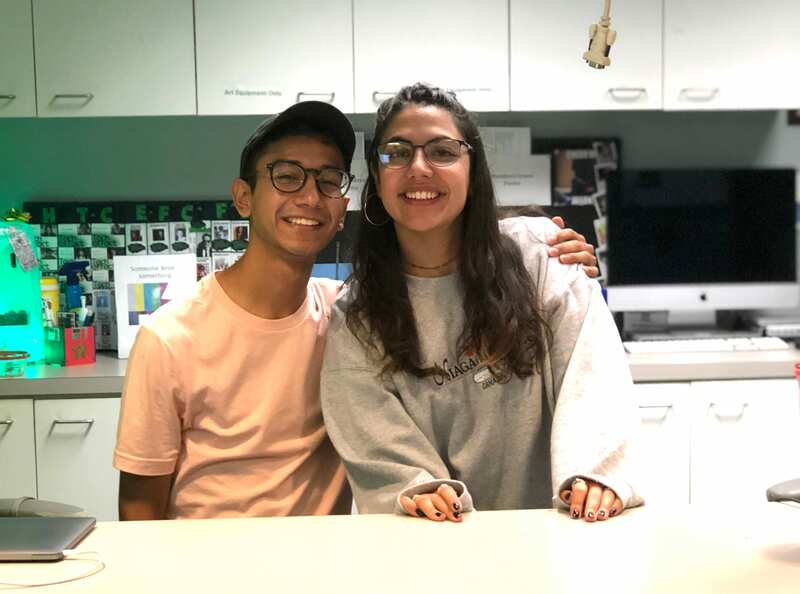 Student workers Mark Valenzuela and Michelle Del Rio work at the Tech Effect desk, fielding a variety of questions and requests. “Typically, students come by to check stuff out like a camera or tripod, that kind of thing,” says Valenzuela. Computer problems? Meadows Tech Effect is ready to help. Located near the Bob Hope Lobby in the Owen Arts Center. Members of the Meadows community can also check out audio recorders and microphones, along with imaging devices such as GoPro’s and Zoom cameras and various other tools that can help accomplish all-encompassing scholastic excellence. Personal training sessions also round out Tech Effect services on such topics as video production and editing, digitizing content and multimedia programs. Art equipment, such as TV monitors and projectors previously checked out from the Division of Art, is now checked out at the Tech Effect window. Valenzuela and Del Rio agree that Tech Effect accomplishes its aim of supporting all who come to the desk. Del Rio echoes Valenzuela’s sentiment that there is always an influx of faculty who need help and feel that Tech Effect is substantially impactful for them as a resource. While Tech Effect is available and willing to help with any issue or request however big or small, Del Rio advises that before you come to the desk with a computer problem, first try turning your computer off and restarting it. That, she says, usually solves the problem. Meadows Tech Effect is located in the Owen Arts Center close to the Bob Hope Lobby. 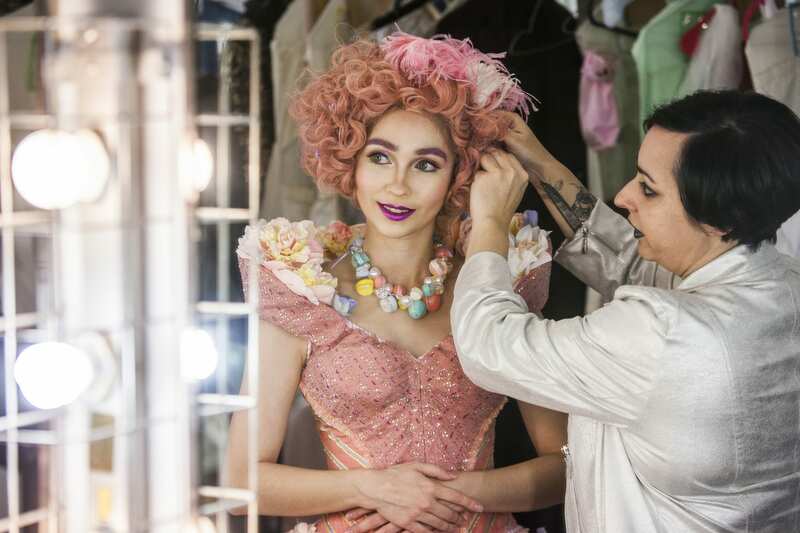 Summer hours are Monday and Tuesday 8 a.m. to 5 p.m., and Wednesday 8 a.m. to 4 p.m. Fall and spring semester hours are Monday–Friday 8 a.m. to 7 p.m. You can reach Tech Effect by phone at 214-768-2652.